The Cavallo Western Bridge Saddle Pad is the ideal solution for a saddle that is too tight at the withers yet lifts off at the mid-back. Thinner at the front and rear and raised in the middle, this pad establishes consistent pressure along the horse’s back while easing saddle fit discrepancy. Lightweight and shock absorbing, the Bridge TSP maintains spinal and wither relief throughout the gullet, while ensuring more comfort and stability. The ideal solution for a saddle that is too tight at the withers yet lifts off at mid-back. 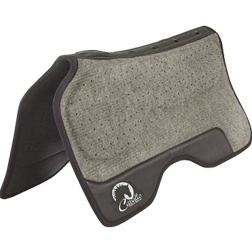 Thinner at the front and rear and raised in the middle, this pad reestablishes consistent pressure along the horse’s back while easing saddle fit discrepancy. Lightweight and shock absorbing, the Bridge TSP maintains spinal and wither relief throughout the gullet, while ensuring more comfort and stability. My name is Lori and I work for the Mayor of Honolulu. The May or has been riding my horses in various parades and the rule the parades have is that every horse needs to be shod. It's so frustrating to deal with these archaic views and policies. They are stating that the heat of the asphalt is detrimental to the hooves. This was not the first time this issue has come across to us at Cavallo. Of course there is the consideration of significant heat conduction and transference from metal shoes on asphalt. Have they ever seen the sparks fly when metal hits that surface or even rocks on the trail at a speed? What about the benefits of protection that our Cavallo soles would provide? There are not studies available, but I can tell you from experience our Cavallo soles do not transfer as much heat as metal. And if you 'compare apples to apples', the benefits of a properly functioning hoof that bears weight and encourages blood circulation is far superior to what happens to a shod horse moving on a hard surface. Here we do have studies! The University of Zurich in Switzerland conducted a study determining that 800 Hz frequency travels up the shod horses’ structure at a trot on asphalt. This amount is enough to kill live tissue, both within the hoof itself and further up the horse’s structure. Our Aloha Festivals 70th Annual Parade was this weekend and the Mayor of Honolulu rode my horse, Misty. As I mentioned before, she has never been shod before so boots were being allowed as a compromise. Your boots worked absolutely perf ectly!! They all stayed in place and did not rub her at all. They actually blended in perfectly and looked so natural. I thank you very much for your support and WONDERFUL boots!! Mahalo, Lori Kahikina All’s well that ends well. I have used the simple boots on all three of my horses for the last 4 years. I run my horses barefoot, but when we go up into the tetons, I always boot them. There isn't anything we haven't experienced in our gorgeous mountains. We have been through deep rivers, sucky mid, slick ice and snow, smooth granite slabs, rocky trails and greasy, muddy slopes. We have never had a boot come off or had one wear sores on my horses feet. Out terrain is rough but incredibly breath taking. I'm 64 and depend on my horses to get me to and from these incredible mountains safely. Thanks Cavallo, for a boot that even a more seasoned (old) lady can get on and off with ease.